The 2019 edition of the Consumer Electronics Show (or CES) showcased several new technologies and vehicular concepts. Dassault Systèmes was proud to be a part of this exciting conversation. We shared our thoughts on how ‘citizen experiences’ would dramatically transform over the next decade. “The industry is heading towards electric vehicles, autonomous vehicles, and also connected vehicles. A lot of companies want to leverage data in order to innovate on mobility services,” noticed Olivier Sappin, VP of Transporation & Mobility Industry, Dassault Systèmes, at the event. 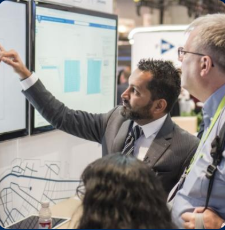 Undeniably, the clear focus at CES 2019 was the emergence of autonomous and electric vehicles reimagining the future of urban mobility. This has also led to heavy investments in Intelligent Transport systems (ITS). Research suggests that the ITS industry will be worth US$ 57.44 billion by 2024, with a large portion of this amount being invested in AI, IoT, image analysis, and smart traffic management systems, improving citizen experiences. As conversations around next-gen vehicles and their most meaningful applications expand and evolve, let’s review some of CES 2019’s exceptional triumphs and cutting-edge innovations. The buzz around green cars is beginning to gather momentum, and CES 2019 saw widespread discussions on collaborations with autonomous technologies. Personalization and ‘styling’ was also a major offering, in-line with rising demand for better in-vehicle experiences. 38% of millennials already consider vehicular adaptiveness and personalization as a vital benefit of mobility technology. Unsurprisingly then, a car at CES introduced a lounge-inspired interior, an integrated sofa and refracted mood lighting, making daily commutes far more enjoyable. Electric-powered vehicles weren’t limited to just basic vehicular models, with a long driving range demoed at CES (with 200 miles on a single charge). The event also marked the public release of the first-ever electric motorcycle, a significant step forward for the luxury passenger vehicle segment. The launch of the hybrid-electric one-person flying vehicle at CES 2019, was proof of increasing interest in air taxis (43% of people expect to be using personal air-taxis by 2030). Currently, at the prototype stage, this futuristic vehicle could have applications beyond only commutes, finding use in military or emergency services as well. In the future, as urban infrastructures change form and landscaping (by 2030), charging stations and landing pads for these new-age vehicles could become a regular feature of a city’s architectural blueprint. A number of three-wheeled vehicles were also part of the display at CES 2019. Combining the efficiency of electric batteries with the ruggedization typical of motorcycles, these could prove to be a game-changer making inroads into more specialized scenarios such as inclusivity-focused riding options. There were smaller, two-wheeled scooters as well (now a staple at CES), as manufacturers try to encourage more sustainable means of traversing short distances. Compact, electric scooters could turn into a mainstay for daily commutes, replacing today’s power-guzzling four/six-person cars. India, for instance, is already witnessing major leaps in EV two-wheeler technology. But the standout at CES among non-traditional form factors was the concept of a four-legged electric car, capable of ‘walking’ over up-to five-feet barriers and ‘climbing’ stairs. This is designed specifically for rescue missions in the wake of any natural calamity or in other harsh conditions. Like every year, trucking technologies registered an impressive presence at CES 2019 and this time, automated driving and electric and hydrogen-powered trucks were at the hub of the discussion. Moving away from the usual stylistic elements and digital accessories, most experts focused on the underlying technology – engine management, service diagnostics, and in-cab automated communications. Studies suggest that by 2025, electric vehicles will have a market potential of 25 million units, with over 400 models publicly available. A large part of this number will be utilized by the trucking industry, inspiring new ideas in urban infrastructure planning (like inductive charging) as well as battery capabilities. CES 2019 was in many ways, a continuation of the key trends in the global transportation sector, transforming how we think of mobility. The notion of ‘shared rides’ was another idea that found resonance at CES 2019. For instance, 77% of millennials expect to share their vehicles in 2030, enabling a US$ 2.7 trillion market for this segment. By 2030, single-ownership vehicles could give way to ‘Mobility-as-a-Service’ (MaaS). Over time, MaaS could also become the most preferred form of urban transport, with the emergence of several new and established ride sharing providers. In anticipation of this trend, the first one-stop ‘social mobility’ app was launched at CES 2019, bringing together the various ride-sharing options, aggregated on the basis of common gatherings, popular locations, and events, culled from social analytics. These were among the principal discussion points and vehicular technology on display, at CES 2019. At Dassault Systèmes India, we are aligned with the government’s mandate of having EV transport on the road by 2030. However, adoption isn’t going to start with cars – we believe that the first point of entry into the Indian market will be two-wheelers: electric scooters and motorcycles, followed by light commercial vehicles. Once the technology (in terms of battery and range) is in place, we can expect EV cars that go beyond the 300 km range. For now, our focus is on India’s emerging EV two-wheeler industry and its intersection with the country’s thriving startup landscape. Last year we collaborated with GoGreen BOV, a Bengaluru startup building vehicles for last mile connectivity between retailers and customers. 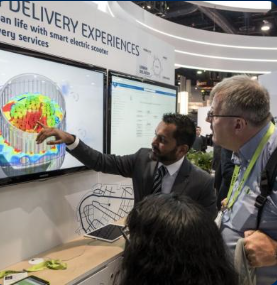 At CES 2019, Dhivik A, Chief Executive Officer, GoGreen (EoT), presented their B2B vehicles for delivery and logistics operations. “Participating in CES has been the biggest milestone in our journey which began in 2008. CES is the mecca of technology and we are proud to be showcasing our connected and battery capabilities to the world,” he said. Dassault Systèmes India is committed to supporting Indian startups, with our unique ‘Electro Mobility Accelerator’ available for OEMs, suppliers, and EV startups alike. CES 2019 was a space for us to build a deeper connect with this ecosystem, learning and experimenting on future possibilities, and helping serve our customers in the best possible way.